The Cherry Blossom Festival in Japan has been happening for centuries—a major holiday for the Japanese people who greet the blooming of the sakura with joy every year in late March or early April. During the Cherry Blossom Festival, millions of Japanese, along with tourists from around the world, enjoy the spectacle of thousands of cherry trees shimmering in the sunlight. During the week-long festival, families gather in the parks for picnics and to enjoy the beauty together. The first day of the Cherry Blossom Festival is officially declared after careful study of the trees at Tokyo’s ancient Yasukuni Shrine, where more than 1,000 trees burst forth with pink-tinged flowers. Even when the bloom is over, the petals raining down and blanketing the ground is still a beautiful sight. It is said that the short life of the cherry blossom signifies the fleeting beautiful of life itself. Lovely, isn’t it? 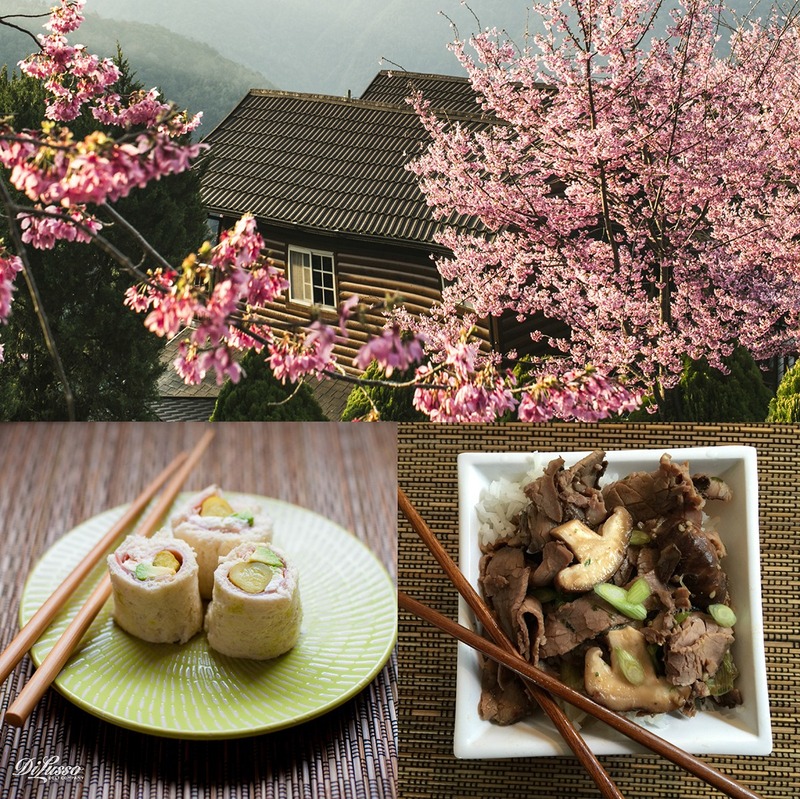 Let that inspire you to prepare our Beef Sukiyaki and Kids’ Sushi, Japanese-inspired dishes the family will love. Have the deli thickly slice 1/3 pound of DI LUSSO® London Broil Roast Beef. 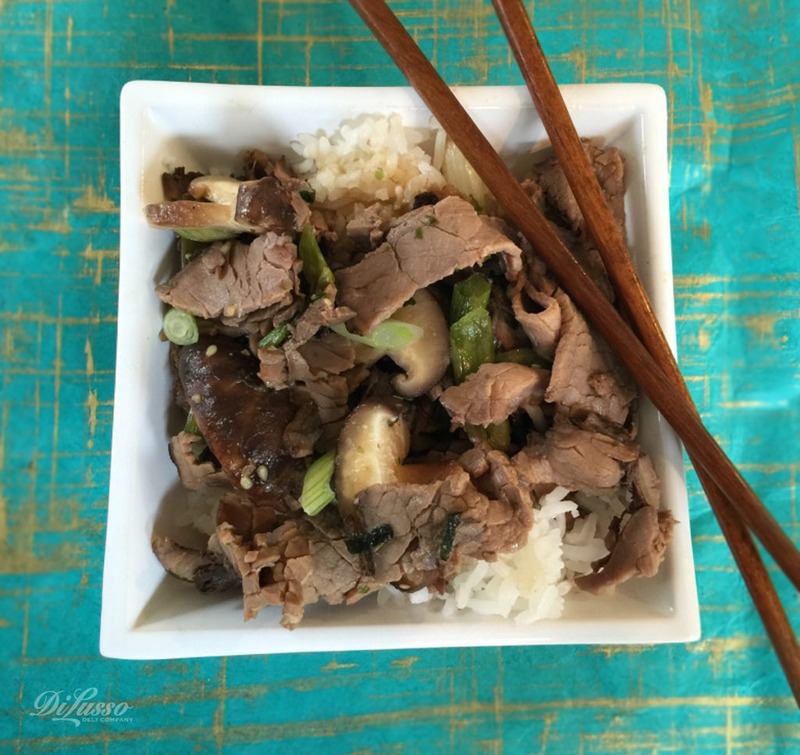 Cut the beef slices into thin strips. Heat 1 teaspoon vegetable oil in a large skillet or wok. Add ¼ cup thinly sliced leeks or scallions (white part only) and sauté until limp. Add one shiitake mushroom, sliced, and continue to sauté another 3-4 minutes. Add beef slices and 1 tablespoon sugar until the beef browns slightly. Add ½ cup dashi (seaweed broth, available at most supermarkets or specialty stores) or beef broth, 2 tablespoons soy sauce, and 1 tablespoon rice wine (or regular white wine). Simmer until heated through, about 3-4 minutes, and serve over rice. For the kids, make pretend “sushi” by rolling up strips of white bread around half a baby dill pickle or chunk of avocado, a little cream cheese, and strips of their favorite DI LUSSO® meats and cheeses. They can even help prepare them! Bamboo sushi mats, which the Japanese use to roll up their sushi into those perfect bundles, are very inexpensive and could be fun for the kids to use. Set out small bowls of DI LUSSO™ Sweet and Hot Honey Mustard, soy sauce or ginger sauce for dipping. Supply everyone with chopsticks and see who’s best at mastering the technique. If you can find blooming cherry branches at the florist—or if your own flowering cherry tree is blooming—use a few stems for a lovely centerpiece.